Dryden High School is a safe and inviting environment. Our aim is to help all students to find a successful pathway in life. We are committed to the pursuit of academic excellence. We believe students learn in a variety of ways. We believe students learn best when provided with clearly articulated expectations and learning goals for success. We believe character education comes from purposeful relationships and community building strategies. We believe education is enhanced through a wide variety of extra-curricular opportunities. Dryden High School is proud to be a composite community high school located in close proximity to the downtown area of the City of Dryden. We have a long standing tradition of excellence in academics, extra-curricular and athletic programs. 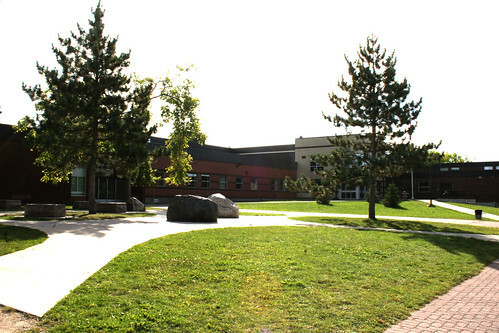 Dryden High School’s foundation is its strong academic program built upon its core disciplines of English, Math, Science, and Canadian and World Studies. In addition, our school offers programs in Technology, Computer Studies, Humanities, Physical Education, Outdoor Education, French Immersion, Business, Arts (Music, Drama, and Visual Arts), Native Studies, Native Language, Cooperative Education, and Alternative Education Programs. We also offer specialized programming in Life Skills and Specialist High Skills Majors (Construction and Transportation). In a safe and inviting environment our dedicated and energetic staffs focus on preparing our students for university, college, apprenticeships and the workplace. We work hard as a team to help ensure the success of all students. We emphasize the importance of choosing the appropriate pathway to promote success for every student upon leaving Dryden High School. Dryden High School serves students in grades 9 to 12. Our student enrolment for the 2018-2019 school year will range from 620 – 640 students. Approximately 155 students entered into grade 9 from four area feeder schools; New Prospect Public School, Open Roads School, Lillian Berg School and St. Joseph’s Catholic School. Currently, 44 percent of our students are First Nation, Metis or Inuit. Fifty percent of our students are bussed on a daily basis. Students arrive to our school from within the City of Dryden, Vermilion Bay, Eagle Lake First Nations, Wabigoon Lake First Nations and a small percentage of students attend from Northern Reserves. The staff of Dryden High School is dedicated to the educational and personal advancement of all our students. Our team consists of teachers, educational assistants, office administrators, a library technician, vice-principals, guidance counselors, custodial staff, a maintenance person, a student counselor, an Aboriginal student counselor and a Mental Health and Addictions counselor. Teaching staff continue to be engaged in a wide variety of initiatives and professional learning to hone instructional practice and improve student achievement. In addition, the staff brings a variety of talents and interests to the school, as many of them are involved in community arts, band and theatre productions, as well as clubs and sporting groups. We currently have close to 70 staff members at Dryden High School. Dryden High School has an extensive website at http://dhseagles.on.ca There are links to a very active DHS alumni site, as well as information regarding school programming and links to teacher websites. There is also a well-developed historical link on the site. Dryden High School has an active School Council. The School council meets five times during the school year. The Council has worked hard to improve communication and inform parents about secondary education. The Council is always supportive and assistive of school projects and new initiatives that provide opportunities for students and improve student achievement. Dryden High School opened on March 5, 1952 on its current site with approximately 300 students. The facility has seen many renovations and additions over the years. Early additions to the building took place in 1955, 1959, 1962, 1964 and 1967. In 1992 the existing built-up asphalt roof for the entire school was removed and was replaced with improved insulation and a rubber EPDM membrane. The total cost of this project was $650,000. There was a modernization, renovation and equipment renewal to 10 shop classes in 1995 at a cost of $ 850,000. The original building constructed in 1952 housing administrative offices, a small gym, 7 classrooms and a staff room was completely demolished and replaced in 1998. At that time, renovations also included upgrading the 1954 & 59 wings, replacing the Library, upgrading Science and Business classrooms, replacing all safety devices and replacement of the overall functional/mechanical operation for the entire building. The project cost was $7,000,000. There have been recent significant upgrades to the Gordon Wood Auditorium, our monitoring and security systems, the installation of wireless service in most areas and the replacement of three computer labs. During the summer of 2005, additional upgrades including new boilers and conversion of the heating system, the installation of central air conditioning into the Gordon Wood Auditorium and the addition of a state of the art Physics and Science lab. An additional computer lab and the retrofit of a remaining older classroom were also completed at this time. Significant work has also occurred outside the building with new windows, drainage enhancements to the Harry McMaster Athletic Field, the completion of the First Impressions program in the front of the school and the installation of two student lounging areas. Our new Student Resource Center continues to help support all students including services for Special Education, with life skills programming, and student support. Our state-of-the-art music room continues to provide the ability to deliver both traditional music and digital music curriculum to students. Most recently the construction of a small school store has been completed in the lower level of the building which students use as a component of their Business studies. The new school store which has been in operation for four years now is called the Eagle’s Nest. Most recently, the First Impressions Program has approved an application from previous school years and is helping to support the upgrade to the “old entrance” of the school closest to the Gordon Wood Auditorium. This area will support alumni memorabilia, student lounging area, and be a communication hub for what has and is happening at DHS through technology. An upgrade to the DHS trophy case has been completed. Wireless access is available to all students throughout the school. We are boastful of the unique and fantastic partnership that we have with the City of Dryden to offer our facilities to house the Dryden Youth Center. The Youth Center is open three days out of the week, Thursday and Friday evenings from 6:00 to10:00 pm and on Saturdays from noon to 8:00 pm. Dryden High School is open during the evening for community members to have access to the hallways and belong to a walking club. Both gyms are very busy throughout the weekday evenings for various groups to use the facilities for their sports clubs.